CMK Financial Services, LLC What to do when you get a notice from the IRS. After all the craziness of tax time is over, the IRS begins the process of reviewing tax returns for accuracy. This process has changed quite a bit over the years. It used to be handled by individual tax agents reviewing returns and requesting information manually. The IRS has taken advantage of technology to automate this system. At the end of each year employers, financial institutes and businesses have a number of informational returns they are required to file. These include W2s and a variety of 1099s. These report the amounts paid to individuals and companies. When you file your individual tax return, the IRS will use their Automated Underreporter Process to electronically match the income you reported with the amounts paid to you by third parties. If the automated process finds a discrepancy, it will pull it aside for further review. An IRS agent will then do a hands-on review to see if the income was reported but perhaps in the wrong place. Such as income being reported on a Schedule C rather than Other Income. If they can tie the total dollar amounts, the case gets closed. However, if the amount is off by as little as a few dollars, the IRS will then issue a letter to the taxpayer. The initial letter will be a CP 2501. This is the preliminary contact form. Don’t ignore this letter! Many taxpayers get unnerved by letters from the IRS and simply choose to ignore them. If you agree with the notice, are disputing, or just need more time to understand what happened, send the response by the deadline stated in the letter. This page has all the necessary information for the IRS to access the account and the issue at hand. The return envelope provided has been set up to route your response accurately. This can cut down the amount of time you may be getting penalties and interest while that letter is finding its way to the correct department. Does it look like a duplicate W2 was issued? Did you report this income in a different fashion on your return? Send the schedules and copies of your income forms along with the response. You want to get this resolved timely because penalties and interest will accrue throughout this process. Sometimes third parties make mistakes in their informational returns. 1099s may get issued in duplicate due to software errors or human error. You will need to contact the payer to have them issue a corrected 1099 or W2. 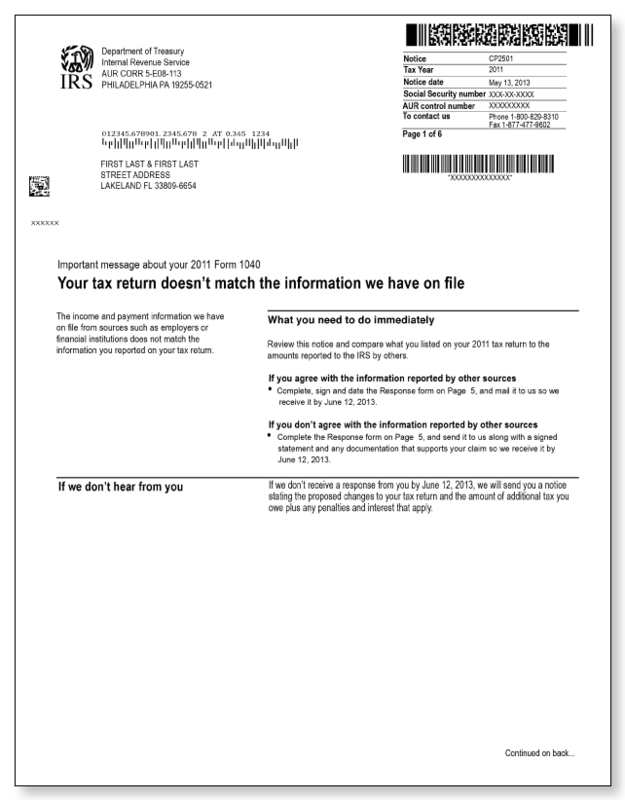 They should issue a corrected informational return to the IRS but you should get a copy of this corrected form and send it back with your response. If you choose to ignore the CP2501, you’ll get a second notice. This will be a CP2000 and will detail the proposed changes and tax calculations. With no information to dispute their position, the IRS will simply assess you the additional tax and amend your return. You can and should, still respond at this point if you want to challenge the assessment. If you agree with the assessment, include the payment with the Response Page and mail it back in the included envelope. If no response or payment is received from the second letter, you’ll get a “90 Day” letter (CP3219A Notice). This means that you’ve been assessed tax and this tax is now delinquent. You still have time to dispute the changes but this must be done by the deadline stated in the CP3219A. The tax court can’t consider your case if the response is received after the final deadline. Contact a tax professional if this process is too daunting. The IRS is just now issuing 2015 CP2501s and may still have 2014 notices to go out as well. It takes quite some time for return accuracy to get processed.